Intrepid travelers visit the Victoria Falls not just to gush over its mile long impressive sprays; there are a host of heart-pumping activities to partake in— from zip lining to bungee jumping. 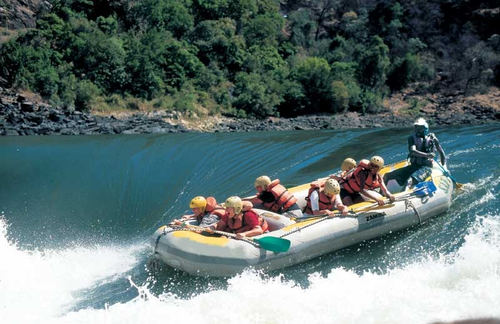 However, any local will tell you that white water rafting on the Zambezi River is an adventure not to be passed up. I made up my mind to do it seven years ago— even though my legs were quaking. It was the most mind-blowing, exhilarating experience I’ve ever had. 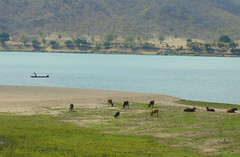 The Zambezi River is the fourth largest river in Africa, about 1,670 miles (2,700 km) long. 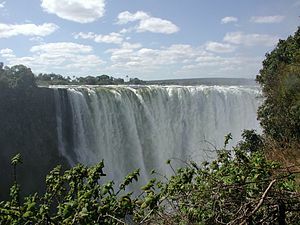 Victoria Falls is the most spectacular of the many waterfalls that line this expansive body of water. Just below is the Bakota Gorge— colossal black basalt walls on both sides of the river fertile in plant and bird life. Here is where adrenaline-hungry tourists embark on a journey of a lifetime. DON’T go there thinking that rafting the Zambezi is the equivalent to a stroll through Disneyland. 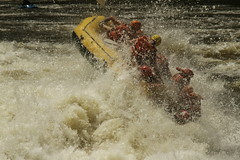 Almost half the rapids on the rafting route are classed at Grade Five. These rapids are described by the British Canoe Union as “extremely difficult, long and violent, steep gradients, big drops, and pressure areas.” Definitely expect to get wet, and know that tumbling into the choppy water is a real possibility. However, expert kayakers will follow your raft to ensure your safety. DO your research ahead of time and don’t be afraid to ask your guide questions. Before your group ventures down the gorge, the guide will lead exercises in paddling and climbing back into the boat should it flip over. Before each rapid, he will tell you what to expect and how it should be navigated. Each one is aptly named: “The Boiling Pot, The Jaws of Death, and The Oblivion” are some examples. “The Giants” made me feel like a WWF wrestler lifted me up and body slammed me to the ground. My head still felt like a fish bowl weeks later. DON’T bring a camera, passport, jewelry, or any other item of value; even glasses should be left behind unless it is absolutely necessary. A kayaker will follow you throughout the day with a digital and video camera to thoroughly document your trip. Purchase is optional at the end. DO bring a positive attitude, courage, and a sense of humor— you will need it! Expect to be tossed about, jostled against the other members of your boat, and perhaps drink a large portion of the Zambezi. The fun is in taking on the unpredictable. DON’T expect to spend time in a raft and be an island unto yourself. 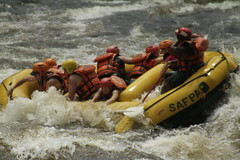 Rafting is a team effort! Each member of the boat is essentially fighting for their safety and yours. Listen to the guide, and communicate with each other. After each rapid my team would yell victoriously and bring our paddles together. For me, these were the best moments of the trip. DO take the time to interact with others when the water is calm. You will engage with people from all over the globe. Introduce yourself, comment on the breathtaking scenery, tell a joke, and attend to their stories. You will be reminded what life is ultimately about: connecting with people and with the world around you. 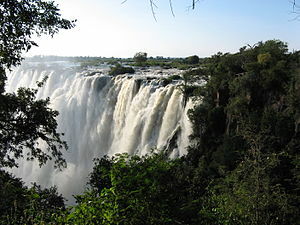 This entry was tagged Africa, Bakota Gorge, British Canoe Union, Raft, Victoria Falls, white water rafting, Zambezi, Zambezi River. Bookmark the permalink. Yes, I can check this activity off my terrifying/amazing list! This is my home country! I dont think I will be doing the white water rafting but will certainly be doing a bungee when I visit next year. Bungee jumping is still pretty bold girl! And doing it here?! Mad props to you— I couldn’t do it. A girlfriend of mine tried it— she yelled all the way down and cried all the way back up lol.